1) "Cheesy" Baked Cauliflower Poppers: Perfect for snacking on while watching football and even your non healthy food loving friends will love these! 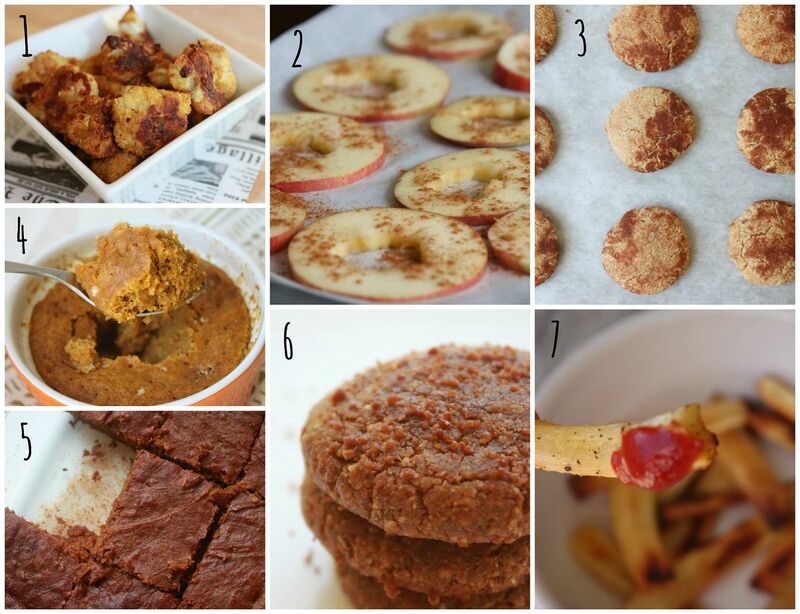 2) Baked Apple Chips: These are one of my family's favorite fall treats! Plus they make your whole house smell heavenly as they bake. 3) Flourless Snickerdoodle Cookies: These are soft, moist and delicious. If you have little cookie monsters living at your house like I do, these will not last long. 4) The Two Minute Pumpkin Pie: This Paleo treat will blow your freaking mind, promise. Sometimes you just need a little treat NOW and you do not have to wait an hour for it to be ready...so when that happens make this. 5) Flourless Pumpkin Brownies: These super moist, cake like brownies are another family favorite with the boys. The pumpkin is not overwhelming and they are juuuuuust right. 6) Pumpkin Pie Sugar Cookies (Paleo): You need to make these. That is all there is to say about these. You will not be disappointed. 7) Baked Parsnip Fries: These are sweet, salty and the perfect healthy alternative to french fries. Have you made any of these treats yet? I would love to hear your feedback if so! Ooh, I must try the cauliflower poppers and parsnip fries! Yum! These all look great! I love making apple chips and been wanting to try making parsnip chips for a while too. I'm just going to check the others out! Yes! Last year I made the pumpkin brownies and brought them for thanksgiving and they were a total hit! mm mm mm I also did the parsnip fries which are so delicious, I'm going to get some parsnips and recreate...next up on my list are the cauliflower poppers!